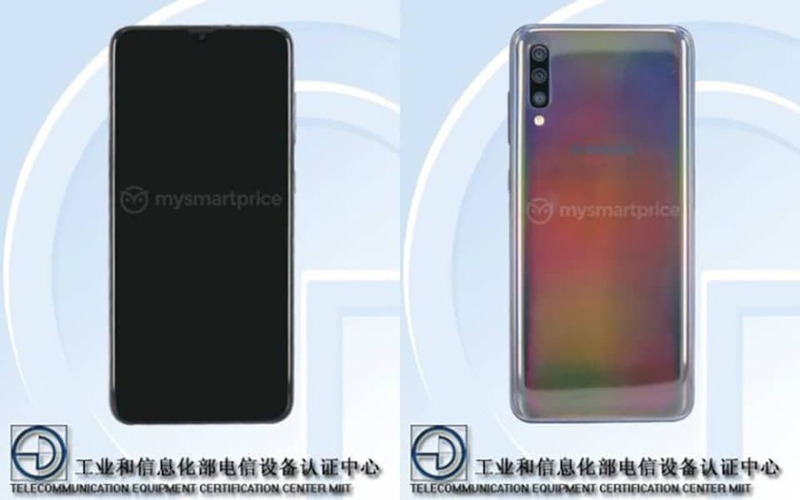 With the appearance on TENAA, the images and specifications of the Galaxy A60 / A70 duo were partially leaked. Samsung is reportedly preparing to launch some new Galaxy A-series smartphones at the event on April 10. Before the event next month, the pair of mid-range Galaxy smartphones A60 and A70 have just recently been certified by TENAA in China. According to Mysmartprice page, Galaxy A60 smartphone achieves TENAA certification with model number SM-A6060. Here, the phone was found to have a 6.3-inch screen with 155.2 x 73.39 x 7.9mm body size and a 3,410 mAh battery. More interestingly, TENAA’s images show that the Galaxy A60 will come with a “punched” Infinity-O screen instead of the Infinity-U and V screens found on other Galaxy A-series phones. eyes recently. On the back of the phone, we can see three camera settings with LED flash module below. Unfortunately, the Galaxy A60 only has a fingerprint sensor on the back instead of being integrated below the screen like the Galaxy A50 model. Switching to Galaxy 70, the TENAA list revealed that Samsung SM-A7050 has a large screen of 6.7 inches, a battery capacity of 4,400mAh and a body size of 164.2 x 76.7 x 7.9mm. While Galaxy A60 has Infinity-O screen, Galaxy A70 will have Infinity-U screen with fingerprint sensor in the screen. In the back, this phone has 3 rear camera system with the help of LED flash. In terms of design, both smartphones seem to have eye-catching gradient color options similar to other 2019 Galaxy A-series models. Unfortunately, the remaining parameters of Galaxy A60 and A70 are not listed on the TENAA. Hopefully, in the next few days, this site will update the list with more complete information about Samsung’s upcoming mid-range smartphone duo.